Diageo has introduced a 1 litre limited edition bottle of Haig Club single grain Scotch whisky, created in partnership with David Beckham and Simon Fuller, which will be exclusive to travel retail outlets. The new bottle has a RRP of £39 in duty free channels. A 70cl version is available in domestic retail outlets. The blue Haig Club bottle, designed by Love, won World's Best Whisky Design earlier this year. Launched in time for the holiday season when the travel retail gifting spend on spirits reaches upwards of US$1bn– 44% of which is on whisky –the new eye-catching bottle is crowned with a standout blue, diamond-shaped stopper. Inspired by the long-standing tradition of exquisite decanters produced by the House of Haig to celebrate special occasions while breaking with traditional Scotch bottle design, the limited edition design is a modern re-imagination of this legacy from Scotland’s oldest grain whisky distillery. 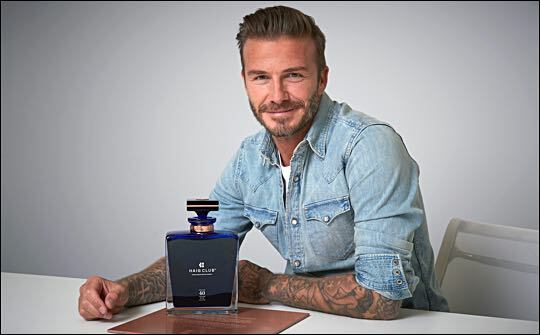 It also takes inspiration from the handcrafted crystal decanter that was commissioned as a gift from Haig Club to David Beckham to celebrate his 40th birthday, earlier this year (pictured below). Peter Fairbrother, global marketing director Diageo GTME: “This striking Haig Club limited edition (in a 1 litre format) has been developed exclusively for our travel retail partners in the run up to the key festive gifting season. Gifting is a key motivator in travel retail during Christmas, New Year and Chinese New Year so we are keen to unlock the potential of this market. We know that customers and shoppers alike want easy access to exclusive and superior gifts.